Measurements: 3 x 4.62 inches; or 75 x 118 millimeters. Back of card: Intricate blue on white pattern. Booklet included: Yes, 16 pages, 2.75 x 4.25 inches; or 68 x 117 millimeters. Publisher: U.S. Games. Printed in Belgium. 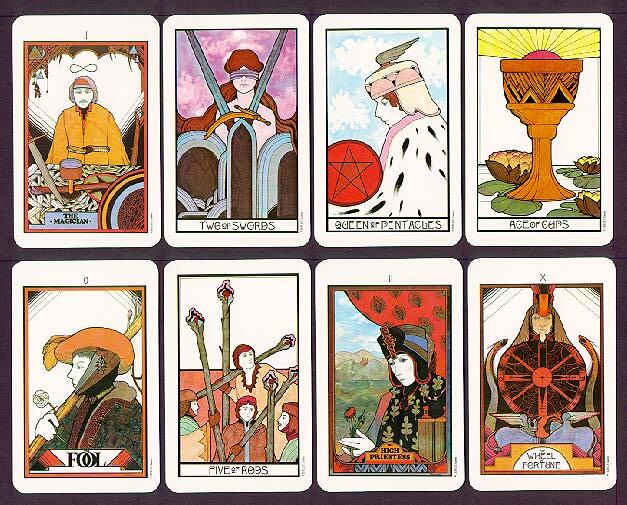 Comments: One of the most famous & beautifully stylized of tarot decks. For fans of the designer, see his more recent New Palladini Tarot Deck.